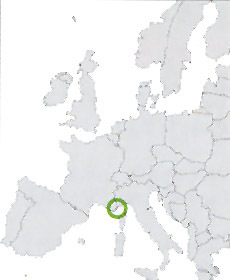 The historical principality of the Grimaldis is the smallest state of the world after the Vatican City, being constituted by a close coastal belt entirely urbanized of only 1,95 Kmqs. On this minuscule territory over 30.000 inhabitants live, therefore with a density record of over 15.000 abs / Kmq. Despite of the exasperated urbanization (consequence also of an extremely advantageous fiscal regime for the residents), the place is very beautiful, especially in the area of the dock and the fortress of Monk, where the Oceanographic Museum rises (over the Building of the Principles and the Cathedral).